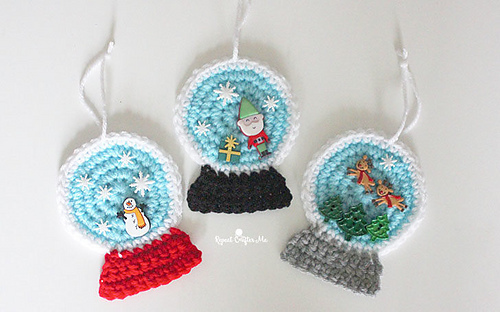 These adorable snow globe ornaments are perfect for those looking for a quick and simple holiday project. 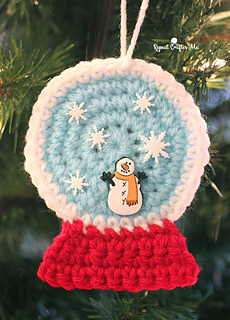 Make your snow globe unique by adorning it with your choice of decorative buttons (or other embellishments). – Bernat Super Value Yarn in Cool Blue, Berry Red, and White. You could also use Grey, Black, Brown, or Dark Blue for the base. 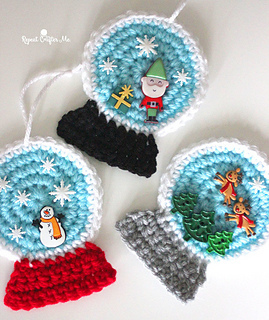 This pattern gives instructions for snow globe ornaments in two sizes.